Death masks are wax or plaster casts made of a person’s face after death. The McComas Collection (1955-2013), in the McDaniel College Archives, contains life and death masks of 66 famous and infamous persons, as well as other paper manuscript materials relating to the collection. The masks in this collection are believed to be cast from masks in the Lawrence Hutton Collection at Princeton University. They were collected by Dr. Henry C. McComas, and given to the College by his cousin, alumni Philip Myers. View the Archives Catalog record for the McComas Collection. 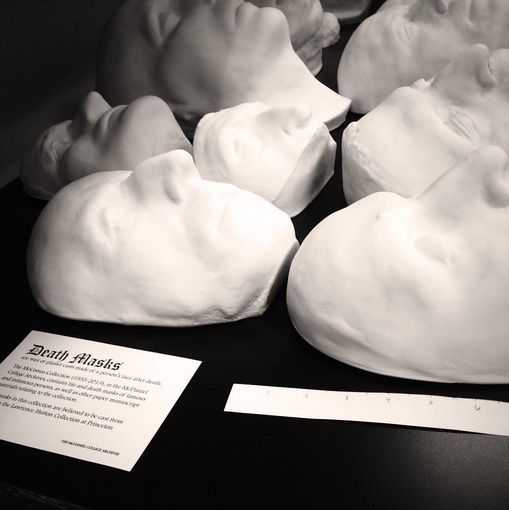 Read the McDaniel Free Press article, "Hoover Library: Home of the Hundred Death Masks" (October 2015). The masks are listed below in alphabetical order by name. Dates given are years of birth and death. If you are McDaniel Faculty and would like to use the masks as an educational tool for your classes, please contact the Archivist to make arrangements. Dante Alighieri (1265-1321) – Italian poet and statesman of the Late Middle Ages; author of the "Divine Comedy"
Ben Caunt (1815-1861) – English bare-knuckle boxer who became the heavyweight boxing champion known as the "Torkard Giant" and "Big Ben"
Samuel Taylor Coleridge (1772-1834) – English poet, literary critic, and philosopher; considered a founder of the Romantic Movement in England with William Wordsworth, with whom he jointly published "Lyrical Ballads"
Johann Wolfgang von Goethe (1749-1832) – German writer and statesman; author of "Faust" and "Wilhelm Meister s Apprenticeship"
Maria Malibran (1808-1836) – Spanish mezzo-soprano who was one of the most famous opera singers of the 19th century. Thomas Moore (1779-1852) – Irish poet, singer, songwriter, and entertainer; lyricist of "The Last Rose of Summer"
Thomas Paine (1737-1809) – English-American political activist, philosopher, political theorist, and revolutionary; one of the Foundinf Fathers of the United States and author of "Common Sense"
Sir Walter Scott (1771-1832) – Scottish historical novelist, playwright, and poet with many contemporary readers in Europe, Australia, and North America; author of "Ivanhoe"
Richard B. Sheridan (1751-1816) – Irish satirist, playwright, and poet; long-term owner of the London Theatre Royal, Drury Lane; author of "The Rivals" and "The School for Scandal"
Laurence Sterne (1713-1768) – Irish novelist and Anglican clergyman; author of "Tristram Shandy" and "A Sentimental Journey"
Jonathan Swift (1667-1745) – Anglo-Irish satirist, essayist, political pamphleteer, poet, and cleric; author of "Gulliver's Travels" and "A Modest Proposal"
Torquato Tasso (1544-1595) – Italian poet of the 16th century, best known for his poem "La Gerusalemme Liberata"
Wilhelm Richard Wagner (1813-1883) – German composer, theatre director, and conductor, primarily known for his operas; composer of "Ride of the Valkyries"
Walt Whitman (1819-1892) – American poet and essayist, author of "Leaves of Grass"
William Wordsworth (1770-1850) – English Romantic Poet, who, with Samuel Taylor Coleridge, helped launch the Romantic Age in English literature with their joint publication "Lyrical Ballads"